A simple probabilistic algorithm for solving the NP-complete problem k -SAT is reconsidered. 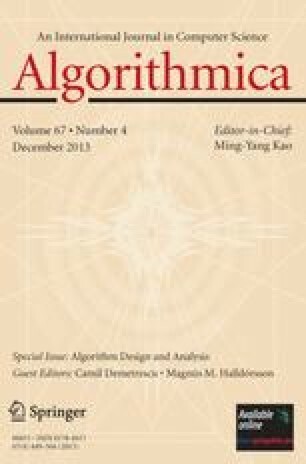 This algorithm follows a well-known local-search paradigm: randomly guess an initial assignment and then, guided by those clauses that are not satisfied, by successively choosing a random literal from such a clause and changing the corresponding truth value, try to find a satisfying assignment. Papadimitriou  introduced this random approach and applied it to the case of 2-SAT, obtaining an expected O(n 2 ) time bound. The novelty here is to restart the algorithm after 3n unsuccessful steps of local search. The analysis shows that for any satisfiable k -CNF formula with n variables the expected number of repetitions until a satisfying assignment is found this way is (2⋅ (k-1)/ k) n . Thus, for 3-SAT the algorithm presented here has a complexity which is within a polynomial factor of (\frac 4 3 ) n . This is the fastest and also the simplest among those algorithms known up to date for 3-SAT achieving an o(2 n ) time bound. Also, the analysis is quite simple compared with other such algorithms considered before. Key words. Satisfiability problem, NP-completeness.